Britain's throw-away society is damaging the environment, wasting precious resources and creating mountains of rubbish. Much of what is thrown away is in perfect working order but is discarded because it is out of date or no longer needed. UK households throw away 25 million tonnes of waste every year - that's about half a tonne per person - and there is another 375 million tonnes of commercial and industrial waste. In general, people are more affluent these days and products are more affordable, so the easy option is to throw away dated or broken items and buy in new ones. The UK is a nation of gadget lovers, but fast-moving technology makes the gadgets of today obsolete within a couple of years in the eyes of many. Often the new gadget is bought as a fashion statement or status symbol rather than for what it offers in terms of new features. The manufacture of electronic goods requires a lot of energy and this contributes to climate change. Yet every year in the UK, more than six million electrical items are thrown out, and more than half are still working or could be repaired easily. The average British resident generates 3.3 tonnes of electronic waste in their lifetime, and these goods often contain harmful chemicals like mercury and lead that have to be disposed of carefully to prevent pollution. A simple way to reduce the pollution is to make use of items for longer. During its production and operation, a desktop PC uses 10 times its weight in fossil fuels and chemicals, so instead of buying a new one consider upgrading the operating system, increasing the memory or replacing the hard drive. There is no need to replace televisions, digital cameras and mobile phones on a regular basis either, yet many people do. Repair and reuse is often cheaper and is certainly a much better option for the environment than recycling or disposal. Recycling requires additional resources to convert the material into a new product, while disposal wastes valuable resources and means more raw materials need to be sourced. Try to find a new home for unwanted items. Donate to charity shops, sell at jumble sales, car-boot sales or online, or swap with friends and neighbours. Take unusable items to a recycling centre so that harmful or valuable materials can be removed safely and either reused or disposed of. More than three quarters of the UK's waste ends up in landfill sites. This creates local pollution, including the production of methane gas, which is one of the greenhouse gases that contribute to global warming. Another nine per cent is incinerated, but up to 80 per cent of it could be recycled instead. Mend or refurbish furniture to give it a new lease of life. Restore sofas, chairs and tables, or recycle unwanted furniture. The Furniture Recycling Network has details of local schemes that pass on furniture and appliances to low income families. 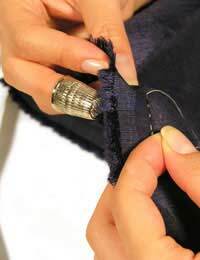 Repair clothes, curtains and linen, hire items that are only needed for a short time. Borrow books and DVDs from libraries or share with neighbours and friends, and do not use disposable products, such as razors, biros and cameras.